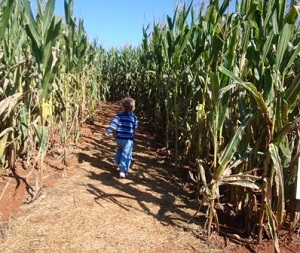 Looking for a local corn maze or hayride in Worcester County, Massachusetts? Scroll down this page and you will see the all of thoses in Worcester County, Massachusetts, sorted by county. Some are huge corn mazes with hayrides, pumpkins, corn cannons, inflatables and others are simple corn mazes with little else. Most also have loads of pumpkins to choose from. To really make it fun for your kids, look for those that have the extra activities, like a corn cannon, cow train, inflatables, farm animals, pumpkin patch or zip lines. There is usually a small fee for the mazes (of course, the more elaborate mazes tend to charge more. Hayrides are often free. ALWAYS call before you go to confirm the info, they don't always report changes to me! 145 Redstone Hill, Sterling, Massachusetts 01564. Phone: 978-422 8888. Alternate phone: 978-422-6666. Email: info@davisfarmland.com. Open 1st August - 31st October . Huge corn maze with bridges, very child-friendly with lots of activities.Davis Mega Maze Zombies OPENS in August! Wojcik's Farm - corn maze, Pick-your-own apples, corn maze, pumpkin patch-pick in the field, pumpkin patch- already gathered from the field, tractor-pulled hay rides, fresh produce, restrooms, picnic area, farm market, concessions / refreshment stand.